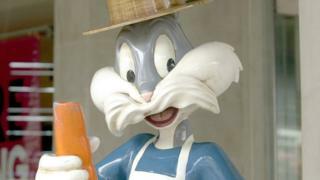 Bob Givens, the animator best known for his redesign of Bugs Bunny, has died aged 99. Givens' career spanned over 60 years and he worked as an animator for companies such as Disney, Warner Bros, and Hanna-Barbera. Givens also drew cartoon characters such as Tom & Jerry, Daffy Duck, Alvin and the Chipmunks and Popeye. His daughter, Mariana Givens confirmed his death on her Facebook page earlier this month. Givens' first role, in 1937, was at Disney where he worked on Donald Duck and Snow White cartoons. He joined Warner Bros in 1940 where he became famous for his work on the Bugs Bunny character. Previous drawings were said to be "too cute" for the cartoons the company wanted to produce. Givens' redesign became the first official design for the lead character of the Looney Tunes franchise, making him a famous name in the industry. He served in the US army during the World War Two, before returning to the animation industry. Givens' career spanned over 60 years. On social media, many paid tribute to Givens' work. Other Twitter users responded by posting GIFs of their favourite Givens animations.